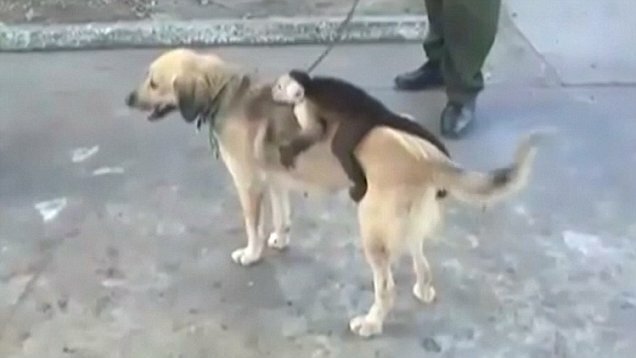 A dog who lost her five puppies immediately befriended a baby Capuchin monkey in Cartegena, Colombia. The pair has been inseparable since residents of the Olaya Herrera neighbourhood introduced the two. The residents picked the baby monkey from its natural habitat and gave it to the dog in hopes of soothing the pain of having lost its puppies. However the monkey reacted aggressively to approaching people and the Environmental and Ecological Protection Police took custody of the animals. The Police are considering separating the duo and sending the monkey back to its natural habitat. However, as per a CBS report, some animal experts believe that the animals should not be separated as the monkey does not know how to live in the wild and could be rejected by its species.